Tonight, on the first ever UFC event to be broadcast as part of the new UFC deal, the rivalry between Henry Cejudo and TJ Dillashaw came to a head in the cage with the UFC Flyweight Championship on the line. Of course, if Dillashaw had had his way, he would have been fighting for the 125lbs belt much earlier. When Demetrious Johnson was on a seemingly unstoppable run at flyweight Dillashaw had challenged him to a super fight, but Mighty Mouse wouldn’t fight Dillashaw unless he had one other fight at 125lbs to ensure he could actually make the weight. When Olympic gold medalist Henry Cejudo shocked the MMA world by dethroning Johnson back at UFC 227 in August, he immediately said he would be happy to accept Dillashaw’s challenge, and the champ vs. champ fight was on. 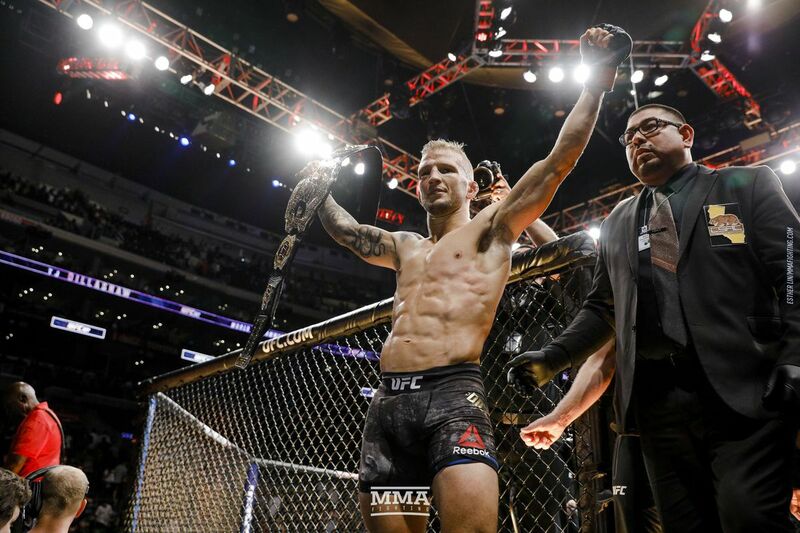 Despite worries that Dillashaw would have difficulties making weight, the ever consummate professional was the first on the scale yesterday, making championship weight at 124.5lbs. This comparison shows the difference of Dillashaw’s weigh-ins at bantamweight and flyweight. Although there was clearly a personal beef between these two guys, the possible implications surrounding the result of the fight went far deeper. Rumours have been circulating for months that the UFC have been planning on removing the flyweight division ever since Mighty Mouse left the organisation to sign with ONE in an unprecedented trade deal involving Ben Askren.